Typical Spanish villa in build on 10.000sqm plot in the region of Pinoso, Ubeda, Lel, La Romana, Aspe, Hondon de las Nieves en Hondon de los Frailes. We just finished the show house. Choice of different model villas, both traditional and modern style. 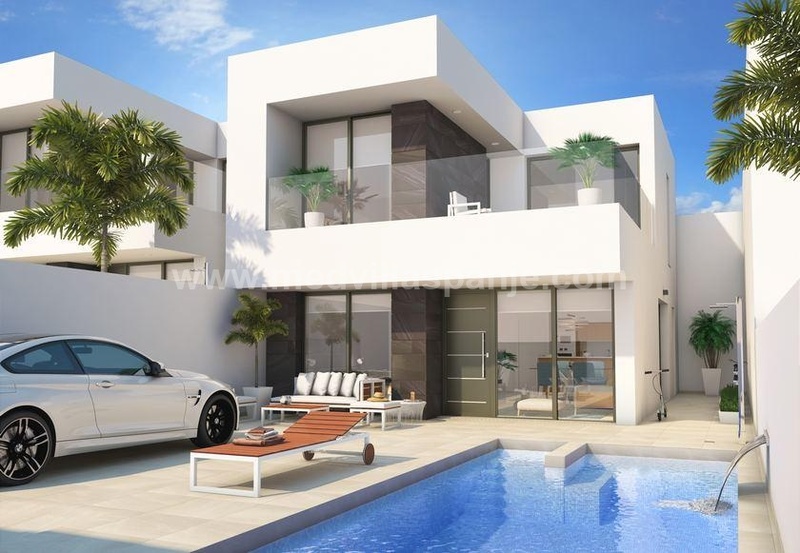 The villa has 3 bedrooms with fitted wardrobes, two bathrooms, spacious living room, fully equipped kitchen with storage, covered terrace and a private pool. Electric and pedestrian gate and +-2000sqm fenced. We offer our customers a wide choice of tiles and kitchen. Plot 10.000sqm value 25.000€ included - All our plots comply with the legal obligation to build a villa, 10 year building guarantee, all necessary permits and architects. Internet, electricity and water connected. The villa is within walking distance of La Romana and has all facilities such as supermarkets, bakeries, butchers, PC store, furniture and electro together with two pharmacists. There is also an excellent Saturday market for fruits and vegetables and all this at 30 min from the beaches and airport of Alicante.